Republican Congressman Steve King says efforts to keep immigration reform from passing the U.S. House are at risk because of a shift in leadership. “There is that risk in September or October and then, of course, in a lame duck session it gets to be a very high risk,” King says. House Majority Leader Eric Cantor lost his Republican Primary in Virginia this past Tuesday and California Congressman Kevin McCarthy is poised to take Cantor’s slot as the number two Republican in the U.S. House. “Kevin McCarthy has advocated for the senate ‘Gang of 8’ bill and we know what that is, so I’m apprehensive about this change in leadership,” King says. Eight members of the U.S. Senate crafted what has been called “comprehensive” immigration reform and the bill passed the Senate last year, but has never been considered in the House. King has been a leading critic of immigration reform — he calls it “amnesty” — and King believes House leaders have “missed the message” from Cantor’s loss. “The anti-establishment vote that cost Eric Cantor his seat doesn’t seem to be something that the House leadership has considered,” King says. King suggests it’s time for new conservative leadership in the U.S. House, and he speculates that while House Speaker John Boehner easily survived his own Republican Primary in Ohio this spring, Boehner may be “mentally fatigued” and may not try to remain as speaker in 2015. King, who was first elected to congress in 2002 and is seeking reelection in 2014, says he would like to see a “strong conservative” from a “red state” get elected speaker of the House. 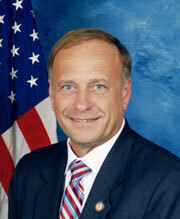 King and Boehner clashed last summer over King’s comments about illegal immigrants.